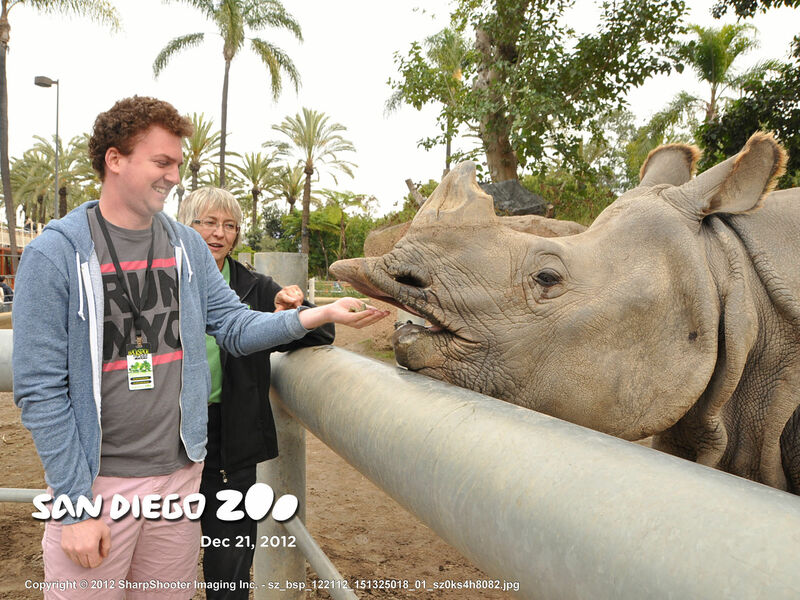 Feeding a rhinoceros during a San Diego Zoo Animal Interactions program. From Sea World to surfing to a world-class zoo, here are our favorite ideas on where to go when visiting sunny San Diego. By the way, southern California is a participant in the CityPass Program which includes the 3-Day Disneyland Resort Park Hopper ticket (back-and-forth admission to Disneyland and Disney California Adventure Park), one-day admission to LEGOLAND California, and one-day admission to SeaWorld San Diego, at a substantial savings off individual tickets for every member of the family. For general information on San Diego, call 619/232-3101 or San Diego Visitor & Convention Bureau. While San Diego is great for families every month of the year, note that October is “Kid Free San Diego.” It’s when over 100 partners participate and open their doors free of charge. Located a short drive from the zoo in Balboa Park, this museum so intrigues kids with one of the largest collections of mini-gauge railroads in the world, that they never want to leave. Exhibits include the Pacific Desert Lines, with miniature trains 1/160 their actual size, and the Toy Train Gallery which includes interactive models for children. The Pacific Desert Line is an N-scale model detailing the equivalent of ten miles of track in the desert. Opened in 2015 to celebrate the museum’s 100th anniversary is the Centennial Railway Garden. This museum offers a rare experience for kids small and large. This museum has the world’s first IMAX Dome theater where they show various educational movies and light shows about the world. Your kids will also find permanent exhibits as well as constantly changing ones, to be hands-on and delightful. Favorites include So Watt! which explores energy, and Kid City (fun for ages 5 and under). Legoland California is fashioned after its European namesake and the first of its kind in the U.S. The 128-acre complex was built using more than 130 million Lego blocks, and features over 60 rides and eight themed areas. In reality, the park activities will interest kids 2-12 years, but visitors of all ages will enjoy the fantastic Lego constructions that adorn the park and the artistry of their builders. Star Wars Miniland presents seven scenes from the epic saga are constructed with 1.5 million Lego bricks, with life-sized models of Star Wars characters and interactive buttons for children to animate the models. The Legoland Water Park features a 45-foot tower, 20 Lego models, a sandy beach wading area, and splashing and spraying Lego friends. The newer Lego Legends of CHIMA Water Park is based on the popular Cartoon Network Series, and there the SEALIFE Aquarium is another popular stop. Your family can even sleep among the bricks at the onsite Legoland Hotel. This is an ambitious, please touch museum where kids and parents alike are invited to create their own art, experience virtual reality simulations and learn with both hands-on and “minds-on” activities. There are artists studios in a variety of media staffed by working artists, opportunities to make art with re-cycled materials, and big galleries for hands-on experimentation, a 250-seat-theater, and the Bean Sprouts Cafe. Parents will appreciate the one-acre Museum Park, located across the street where The Garden Project is for playing and learning. At this museum, kids are encourage to create and participate. Surf Diva– a premier surf school for women, Surf Diva is located on La Jolla Shores. Open year round, they offer lessons for men, women, children and teens. La Jolla Shores provide an excellent landscape for beginners. Pacific Surf School– Private, semi-private and group lessons workshops at this school are provided by surfing veterans, and take place on the calmer waves of Mission Beach as well as Pacific Beach and Ocean Beach. There are Day and Overnight Surf Camps for ages 6-17. With year round surfing, Mission Beach is a great spot, especially for beginning surfers. San Diego Surfing Academy-Oceanside, California is home to the San Diego Surfing Academy, which boasts expert instructors teaching students how to paddle, ride their board, and select the right wave. This beach is great for beginner and intermediate level surfers because of its soft sand bottom. On rainy or low tide days, check out Wave House on the Mission Boardwalk, which offers FlowRider and FlowBarrel simulated surf platforms that allow expert surfers to improve their skills with non-stop waves. Follow 1-8 to Mission Bay Dr. or Ingraham St., or 1-5 to Mission Bay exits. Unsatisfied by miles of beautiful natural coastline, the city transformed a swamp into a 4,235-acre outdoor aquatic sports center open year-round. Here the family can swim, sail, windsurf, kayak, waterski and fish, mostly in areas designated for one sport only. On land there are picnic areas, fire rings, playgrounds and plenty of open spaces, and boats and equipment are available for rent at several marinas. Check the website for a schedule of free programs; services are reduced during the November to March winter season but it’s still a great day out. This privately-owned museum is located in a great park and is free of charge — what better reason to expose the kids to some wonderful American, Russian and Western European art. Free tours led by docents are designed for ages 6+ and are given daily except Monday, when the museum is closed. Also, the Putnam Foundation Collection features San Diego’s only painting by Rembrandt. Great marine exhibits and shows make SeaWorld must-see entertainment for all ages.”Sesame Street Bay of Play” is a two-acre Sesame Street-themed interactive play area that includes Elmo’s Flying Fish, Abby’s Sea Star Spin and Oscar’s Rocking Eel rides. Your Little One can have his or her picture taken with their favorite character. The Sesame Street Party Parade featuring floats, songs and musical performances debuts in May of 2018. Big kids will appreciate the rides and shows which are very well done. This cement boardwalk has sweeping views of the harbor, and is a great place to rollerblade, fly kites, or just relax and take in the fresh air. Small islets offshore have grass for picnics. To purchase picnic fare, art or other souvenirs, take a stroll through Seaport Village, an eclectic small mall. The history of aviation, famous aviators, and restored engines and aircraft (such as one from U.S. Army Air Corps Boeing P-26) are on display. The exhibits track the history of flight from the Wright Flyer, to World Wars I & II to the Jet Age. Also, great for kids, there is a 2 Seat Interactive Simulator Ride that gives riders the opportunity to sit in the cockpit of the FS2000. This theater offers both indoor and outdoor performances and stages an outdoor summer Shakespeare festival that’s a great opportunity for introducing the kids to the great playwright. More contemporary plays performed here have included Double Indemnity and Dr. Seuss’ How the Grinch Stole Christmas, which also has a special “Autism-Friendly Grinch” performance over the holidays. This very large public park is a top choice for any family visiting San Diego. Besides the San Diego Zoo and 17 museums and cultural institutions, the 1,400-acre park includes 10 performance spaces, three playgrounds, well-maintained gardens and acres of open grass for playing and picnicking. El Prado, the main thoroughfare, is lined with Moorish-style museums and theaters, some dating as far back as 1915. This world-class zoo is a simple must-see, especially the habitats such as Elephant Odyssey and the Polar Bear Plunge. A leader in its field, the Zoo focuses on conservation and animal behavior while giving guests a chance to interact with its amazingly diverse collection. The facility is so large that many families will want to take the tram tour; however, allow enough time to return for closer inspection since it’s hard to see shy animals over the crowds. Special interactive shows (at extra cost) include “Animals in Action” where a trainer introduces the audience to several animals. Our family enjoyed the show and learned a lot of odd facts about the African porcupine, rhinoceros, arctic wolf, ground cuscus and other trained animals. Feeding a rhino is pretty cool. For a surprisingly different experience, spend the day at this wildlife preserve dedicated to protecting endangered species. It’s run by the San Diego Zoo and once you get beyond the zoo-style exhibits near the entrance, you can appreciate what it’s all about. Fun activities for preschoolers include “Lorikeet Landing” where kids can feed colorful birds, and the Africa Tram that runs through certain animal areas. There are animal encounters, shows, play areas, and a selection of “Safaris” – for an additional fee. The Flightline Safari is truely an adventure as while harnessed, you soar for 2/3 of a mile at 130 feet above the ground and get a bird’s eye view of the animals and park. You and your family can tour this ca. 1888 seaside hotel (a National Historic Landmark) a few days a week with docents from the Coronado Visitor Center, then go for a beach walk. Tastefully decorated, this grand gingerbread Victorian is quite enchanting, and as worthy of a quick look as a week-long stay. It’s very crowded over the winter holidays when a skating rink is set up out back but fans of films like “Some Like It Hot” (yes, Marilyn Monroe stayed there) will enjoy seeing it any time of year. View many restored historical structures such as colonial homes and early mansions. This area was California’s first European settlement, and has retained that magnificent old-world-charm. Numerous Mexican restaurants and an open-air crafts and arts market are contained within a large plaza, making it ideal for strolling with little ones. We enjoyed our meal at Casa Guadalajara, one of Old Town’s most historic places. This is the “happening” area in downtown San Diego, popular with convention-goers and families touring the harborfront. A wide variety of shops, over 200 quality restaurants (including Cafe 222 famous for its breakfasts), bars, nightclubs and lounges, as well as renovated Victorian-era architecture await visitors within this 16½-block historic district. A great locale for an evening stroll, there is great live entertainment at various pubs and eateries. Tourists to San Diego have been hopping on and off these bright red trolleys since 1989. Offering several routes and stops at major attractions, this is a great way to experience the city.